Madison Water Utility has rebuilt the city's 75 year-old municipal Well 7, located off North Sherman Ave. near Sherman Middle School. The facility has a larger reservoir and a second booster pump added to provide stronger fire protection for homes and businesses on the north side. An iron and manganese filter was added, so the water pumped from Well 7 will look better and taste better. The project cost was $5.3 million and was completed in June of 2015. You can find out more about the history of Well 7 on our Inside MWU news page. The new Well 7 facility is complete. Varied wall heights and textures are meant to make the building appear smaller. 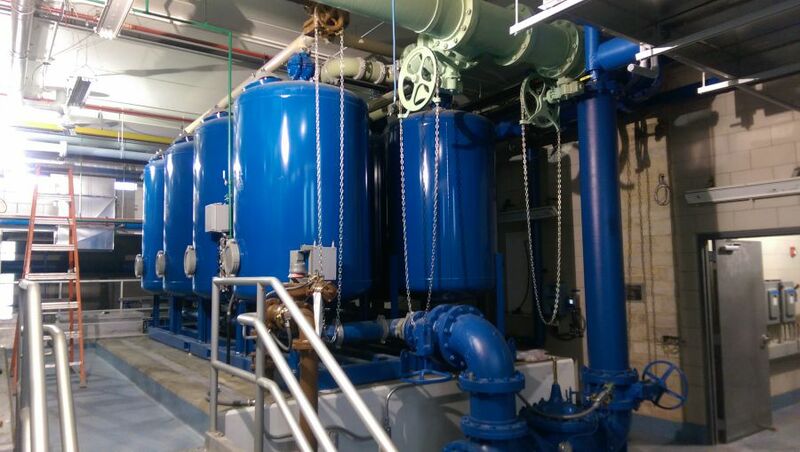 Inside the facility, a large bank of filters has been installed, which will remove naturally-occurring iron and manganese from the water as the well pumps about 2,200 gallons a minute. Constructed in 1939 as a Federal WPA project, Well 7 was the main source of supply for the north side of Madison for many years. With a pumping capacity of 2200 gallons per minute and a daily capacity of 3 million gallons per day, the well is a vital component of Madison’s drinking water system. With the abandonment of Well 3 in 2008, Well 7 provides year around water supply to neighborhoods along North Sherman Avenue west of Packers Avenue as far south as the Yahara River. Well 7 also provides water to the Village of Maple Bluff. The long term need for Well 7 was studied as a part of the East Side Water Supply Project, which was completed by MWU in 2012. That study confirmed the importance of Well 7 and recommended the addition of a filtration system to remove nuisance contaminants, iron and manganese. Due to the age and condition of the existing facility, employee access issues, reliability, redundancy, fire protection capacity limits and current DNR regulations, MWU will be demolishing the existing structure and totally replacing the facility. To accomplish this, we have acquired the two residences adjacent to our property. These two houses were removed in early 2014 to make way for construction. Madison Water Utility has formed a Citizens Advisory Panel (CAP) for this project and worked closely with this group to develop and refine this project. A public meeting will be held before construction begins and a neighborhood open house will be held following construction. If you would like to participate in this process for this or any other project, please contact us at 608-266-4651 or water@madisonwater.org. Well 7 is a key water supply, transmission, and water storage facility within the Madison drinking water system. The well provides drinking water supply to over 10,000 residents on the north side of Madison. Water quality concerns resulting from iron and manganese at or above secondary standards make the need for a filter a priority. Iron and manganese can cause staining on plumbing fixtures, and colored water events are disruptive to area residents. In addition, the existing facility is in need of significant repair and upgrading. It does not meet current standards or DNR codes for reliability, redundancy or capacity, and employee access issues make maintenance a problem. The proposed facility will remove iron and manganese from the water. It will provide a reservoir with a capacity of 500,000 gallons to fight fires and provide water supply in an emergency. Standby generation and redundant pumps will ensure operation of the well even during an emergency or natural disaster. Why don’t you just modify the existing pump station and reservoir and use it? The existing facility is too small and would require major work to meet current needs. This would limit functionality, it would drive up construction costs, and would impact long term operation of the facility. 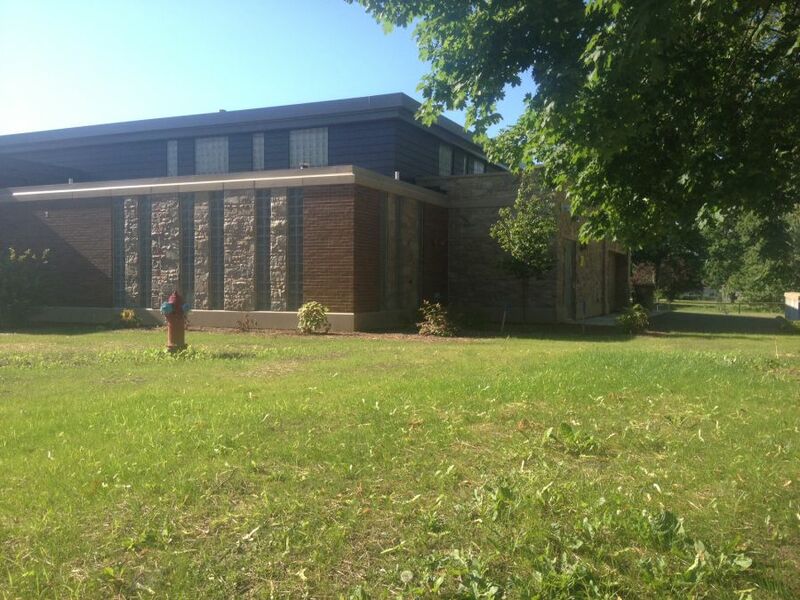 MWU will be making a photographic record of the facility, salvaging significant items from the building and will be incorporating some of the stone into the new facility. Why did you have to buy two houses for this project? There was not sufficient space on the existing lot to construct the new facility. The property owners were contacted and an equitable settlement was negotiated in addition to relocation assistance. Where will I get my water during construction? Madison’s water system is interconnected and the area will be served by several other wells: Well 13 on Wheeler Road, Well 15 on East Washington, Well 11 on Dempsey, and Well 29 on Mesta Lane. Will my water service be interrupted during construction? While some very short term (4 to 6 hours) interruptions in the immediate vicinity of the project may occur, no other interruptions are anticipated. Following construction of the filter, you will notice less staining on plumbing fixtures and there will be less chance for colored water events in your neighborhood. No change in taste and odor is anticipated. Architectural renderings of the new facility are available on this web page. The structure will have multiple flat roof levels and a variety of building materials to give it interest and shape. Will the facility make a lot of noise? Noise levels will be similar to that currently produced by the structure. The standby generator will be exercised monthly for a few hours. The generator will be fitted with noise control baffles that will limit the sound coming from the facility when the generator is running. Construction will take a year to complete. It is expected to start in April 2014 and be complete by May 2015. Will there be a lot of traffic to this facility once it is constructed? Well 7 will be visited our operation personnel once a day for about 15 to 20 minutes. On occasion a maintenance crew will spend a day at the facility servicing the filters and pumps. Approved design for the facility. MWU requested proposals for engineering design services for an iron and manganese filter and facility reconstruction at Madison Water Utility Well 7. Held at project site on Sherman Ave.
Held at the Goodman Community Center and Warner Park Community Recreation Center for the Well 7, Well 8, and East Isthmus Replacement Well projects. A Well 7 and Well 8 meeting at the Goodman Community Center. In July 2010, Madison Water Utility (MWU) began the East Side Water Supply (ESWS) Project, a major water supply planning project that paired professional and scientific expertise with community engagement to recommend future infrastructure on Madison's East Side. In October 2010, a Citizen Advisory Panel (CAP) was formed for this project. The CAP met and advised MWU on public expectations for drinking water quality, water supply and demand, and water conservation. Water Conservation on the East Side of Madison. Accept the recommendation of the East Side Water Supply Citizens Advisory Panel and staff to use an appropriate treatment technology to remove iron and manganese from Unit Well 7. Allow room for potential future treatment needs. Continue the Public Participation Process with a Well 7 Citizens Advisory Panel through Phase 2 - Facility Site Selection and Phase 3 - Facility Design.